Hey guys! Class has officially started for these classes, but registration is still open, so there is still time for a giveaway! 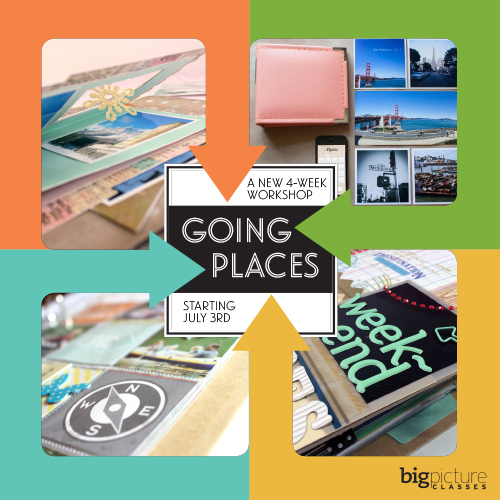 I have one seat available for each of these awesome classes at Big Picture Classes: Here & There Inspiration taught by Kelly Purkey and Amy Tan; and Going Places taught by Katrina Kennedy, Tami Morrison, Angie Gutshall, and Kim Jeffress. Both classes started on July 3rd, but have registration open until the 9th. First up, is one of the 4Experts classes (one class each quarter is a 3 month long class taught by an expert or experts in the industry…no, you do not have to be an expert to take!) These are a little pricier, but you get them for 3 full months and they are packed with info. 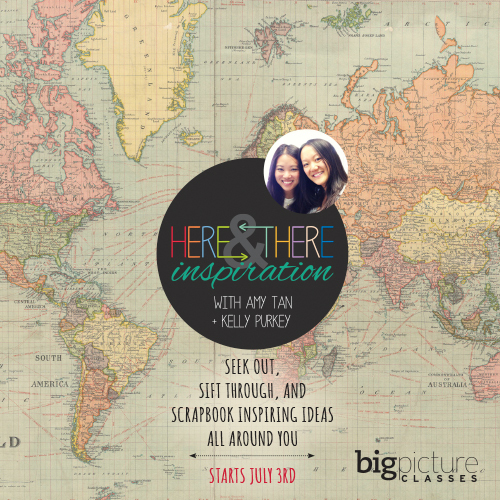 This one looks amazing, and how could it not…taught by the very inspirational Amy Tan and Kelly Purkey! In the immortal words of Ferris Bueller: "Life moves pretty fast. If you don't stop and look around once in a while, you could miss it." Next, there is an awesome group class about travel albums, which is an absolute steal at $25. This should help get your wheels spinning for ideas on how to document your travels. I love travel albums and hope to share some of my own soon. To be entered in the giveaway, just leave a comment here. For an additional entry, leave a comment on my post on Instagram. Giveaway will close tomorrow night, 7/7/2014, to allow time for the winner to register for class. Good luck and enjoy all the inspiration of these two classes!! Thanks to everyone for entering! Wish I had more seats to give away! Winner of Here & There: the_vintage_giraffe and winner of Going Places: Tammydee1963. For a 10% off coupon code, check out Paperclipping Roundtable here. They have a coupon code and while you are at it, check out the podcast! It kept me going for 2 years of long long long commutes!